Northern Virginia, and a vast majority of Suburban America, is enchained in frappuccinos. In NoVa-Suburbia Land, Coffee is not coffee. Rather, coffee is a hazy understanding of something burnt combined with lactose, sweetener and whipped cream. Make that a grande. Route 29, piercing the heart of Fairfax, was devoid of anything worthy of referring to as “cafe.” The lone star was Caffe Amouri of Vienna, a local hotspot for many great single-origin beans, thanks to meticulous in-house roasting. But that’s Vienna. And one Caffe Amouri cannot pump enough of its black liquid gold through the entire region. Enter 29th Parallel Coffee & Tea. Barely a month old, this new cafe would have been a revolt against the NoVa coffee scene, if one exists. More accurately, 29th Parallel is attempting to build a niche, one bag at a time. I honestly had low expectations as I walked through its doors, but I always have low expectations when trying out new cafes. The cafe uses beans exclusively from PT’s Coffee Roasting Co., an award-winning (Roast Magazine’s 2009 Roaster of the Year) roaster based in Topeka, Kansas. Coffee doesn’t jump to the forefront when I picture Kansas, but PT’s is dead serious. When I visited, the cafe featured a variety of beans from Ethiopia, Guatemala, Costa Rica, Bolivia, and Panama. The beans were fresh. The cup of Ethiopian Sidamo I tried, and all of the 12 oz whole beans on sale, were roasted within ten days of purchase. Amir Khalil, the manager, told me their current turnover rate for inventory is about ten days, and their goal is to shorten that even more, to about a week or less. Amir and his staff knew their stuff, and we struck up a great conversation about coffee regions, brewing methods, and NoVa coffee culture. By the way, that cup of Deri Kochoha, Ethiopia? Superb. Anyone who has a decent understanding of good coffee knows Fairfax needs just that, good coffee. Real coffee. No more fraps. It’s time to graduate, and 29th Parallel sheds hope to this barren region. Great seasonal varieties, excellent roasting, skilled brewing. Now available on Route 29. From the photos, I absolutely delight in the simplicity of the place. The coffee shops today remind me of department stores in the mall full of banners and placards demanding your attention. Losing all of the “look at me” specials turns the focus back to what it should be: the unassuming, really great, cup of coffee. Next time I make it up form the middle regions of VA, I’ll be sure to check it out. 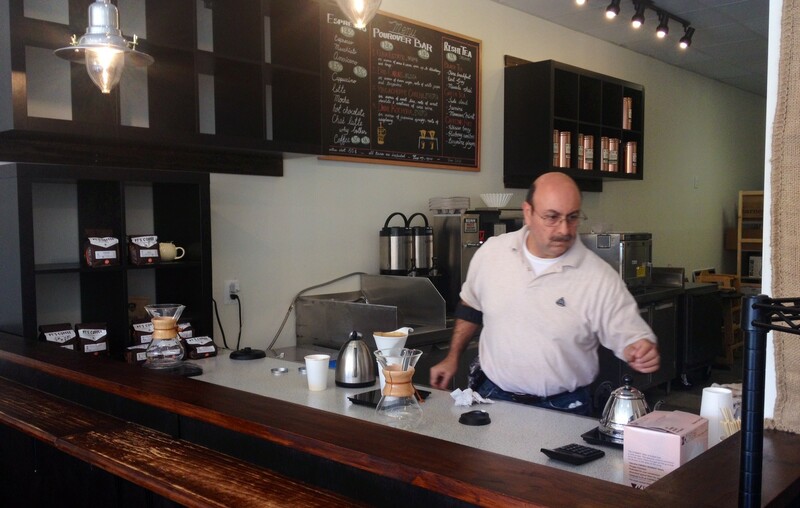 Amir is passionate about coffee, and his cafe speaks of that passion. While they exclusively brew and sell PTs coffee, the beans are fresh and meticulously roasted. Wifey and have been there a couple of times. Lattes are great! Nice to have a good, local coffee shop within walking distance. Proprietors are very engaging and I like their pricing – taxes included in the posted prices. I recently bought a bag of Elida Estate, Panama from 29th Parallel, and it is superb. I have also tried their El Matazano, El Salvador, and Deri Kochoha, Ethiopia. All superb. Very fresh coffee from PTs.